Rembrandt worked so closely with his fellow artists that scholars are still at odds over which paintings are the “real” ones. Your guess may be as good as theirs. This article originally appeared in the June issue of Art & Antiques Magazine as “Master of Mystery”. “Rembrandt in America,” which opens at the Minneapolis Institute of Arts on June 24, is a fascinating but flawed exhibition that in many ways mirrors the confused state of Rembrandt scholarship today. The show is a hodgepodge—for one thing, due to the extreme difficulty of getting Rembrandt loans, it’s missing many of the most notable examples in American collections. However, a more fundamental reason why is that the organizers apparently never really decided what their exhibition is about. Is it a chronological presentation of Rembrandt’s work? Is it an attempt to distinguish between the work of Rembrandt and the works of his followers? Is it a statement about the history of collecting, and thus a sort of oblique portrait of the American robber barons of the turn of the century, told through the art they liked to acquire? While these topics are very interesting, they’re also complex, and the catalogue never decides whether it’s a popular book or a scholarly one. It doesn’t quite work as a popular life of Rembrandt because it’s too encumbered by technical arguments and because of its haphazard rather than chronological arrangement of images. But it’s not exactly a scholarly book either. Most notably, the arguments about attribution are often difficult to follow because essential pieces of information are missing. The key comparative works generally aren’t in the show (and often aren’t illustrated in the catalogue) and there’s no systematic attempt to document the range of opinion about a painting’s authorship, as embodied in past publications and in the writings of living scholars. For all these flaws, it’s an exhibition worth going out of one’s way to see, not only because Rembrandt’s autograph paintings are worth the trip but also because the chaotic way it presents its information gives a good picture of what life is generally like for a working art historian—whether a museum curator or an auction-house expert—struggling to figure out whether a painting is right without all the facts and on a tight schedule. The visitor has an opportunity to pretend that he or she is facing the choice of whether or not to buy a particular Rembrandt. Is it right or not? How do you decide? It’s the art-world equivalent of being placed in the cockpit of a jetliner and invited to fly. The perennial problem of disentangling Rembrandt’s work from that of his contemporaries is intimately bound up with what made him so original—his intense, promiscuous engagement with the work of other artists. Like many another great master, Rembrandt was an imitator and copyist; in addition, he liked to surround himself with pupils and acolytes who imitated his work. At the center of the exhibition stands a paradox that probably no figure in the history of art has been so widely praised as Rembrandt for the uniquely personal qualities of his style, but distinguishing his work from that of his followers was often difficult even in his own lifetime and has become even more so over the three centuries since. Today, the greatest Rembrandt experts on his work often disagree about which paintings he executed, not only with minor works but with some of the most famous ones, such as The Man with a Golden Helmet or The Polish Rider. For that matter, there’s The Return of the Prodigal Son in the Hermitage, which one of the authors of this catalogue, Tom Rassieur, singles out as one of the most masterful examples of Rembrandt’s work but which has always impressed me as clumsy and pedestrian, with the awkward bare feet of the prodigal son pushed into the viewers face and figures that don’t convincingly engage with each other. 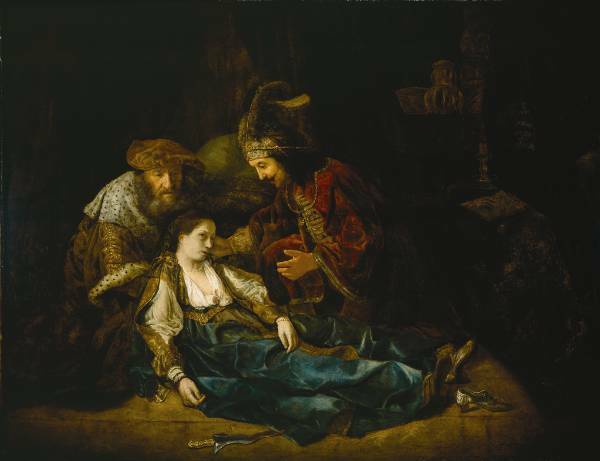 I’ve always been skeptical that Rembrandt made it, and some years ago Walter Liedtke, curator of European paintings at the Metropolitan Museum of Art in New York, suggested to me that it might well be by Samuel van Hoogstraten. I’ve always been skeptical that Rembrandt made it. As Walter Liedtke, curator of European paintings at the Metropolitan Museum of Art in New York, recently suggested to me, if it is by Rembrandt, it seems most likely that it’s an unfinished work that was later awkwardly touched up by one of his pupils. 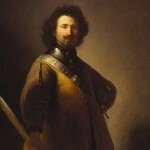 This chameleon-like character of Rembrandt is evident in his career from the outset. As a precocious teenager in Leiden, he worked closely with a slightly older artist, Jan Lievens, and may even have shared a studio with him. They painted the same models and subjects in a very similar style, both emulating and competing with each other. Their work is so close that it seems to have gotten confused when they were both still in their twenties. Most scholars believe that a “Rembrandt” in the Queen of England’s collection, recorded in an inventory of 1639, is really by Lievens, though as is to be expected, some disagree. On the other hand, two paintings by Lievens recorded in a 1632 inventory of the Dutch royal collection are now generally believed to be by Rembrandt. What’s more, during this same period, Rembrandt took on his first pupil, Gerard Dou, who in some ways mastered Rembrandt’s early style, with its meticulous manner of rendering, even more fully than Rembrandt did. 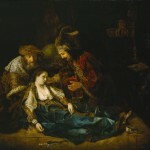 In the 17th and early 18th centuries, when technical skill was highly prized, prices for Dou’s paintings often surpassed those achieved by major paintings by Rembrandt. Dou may well have helped Rembrandt with some of the more dazzling passages of tightly executed still life in his early work, such as the gleaming silver vessel in the foreground of his marvelous Jeremiah Lamenting the Destruction of Jerusalem (1630), in the Rijksmuseum. Notably, this same sort of confusion continued right up to the end of Rembrandt’s career, with the added twist that in his later years the names and styles of his close associates are not very well documented. In some cases we know the names of individuals who associated closely with Rembrandt, such as Constantijn van Renesse or Rembrandt’s son Titus, but don’t know what their paintings looked like. We can identify van Renesse’s drawings but not his paintings, and while a 17th-century inventory attributes some paintings to Titus, we can’t identify any of his work today and don’t even know for sure whether he ever achieved real proficiency as an artist. In other instances we have clusters of paintings that show close knowledge of Rembrandt’s work but don’t seem to be by him, and it isn’t currently possible to determine conclusively who made them. What might loosely be termed “modern scholarship” on Rembrandt has gone through two phases, and we seem to stand on the threshold of a third. The first phase lasted from the later 19th century into the 1930s and was fueled by an insatiable market for Rembrandt’s work. His name was almost a synonym for the term “artistic genius,” and he was viewed as a figure with a miraculous ability to see beyond the surface of things into the depths of the human soul. 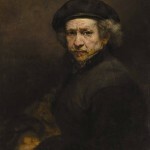 During the age of the robber barons, some of the wealthiest men in America, such as Andrew Mellon, Jules Bache, Henry Clay Frick and Henry Havemeyer, competed fiercely for works by Rembrandt. Indeed, Havemeyer had a large room entirely devoted to paintings by Rembrandt—or at least paintings then attributed to him. And here we come to another paradox: Why do rich people like paintings of poor people, who in real life they wouldn’t allow into their homes? During this period new Rembrandts were discovered at a rapid pace in castles and private collections from Stockholm to Budapest and were sold for ever-escalating prices that often made newspaper headlines. Facilitating this process was a group of experts and scholars in the discipline of art history, which was moving away from being an amateur’s domain toward being a subject taught in universities and was developing methods of analysis that had a quasi-scientific aspect. Figures such as Wilhelm von Bode, Abraham Bredius and Wilhelm Valentiner issued “certificates” declaring which works they judged authentic and assembled catalogues of Rembrandt’s work reproducing the paintings they judged to be autograph. On the positive side, the beginnings of a sifting process were underway, in large part because these experts assembled large troves of photographs—not very good ones, to be sure—which made it possible to put works side by side and compare their artistic qualities. By modern standards the process was not very rigorous or critical, and since experts were generally paid well for discovering or authenticating paintings, the process was a bit corrupt. In addition, ideas of what constituted a “Rembrandt” were largely shaped by whether qualities of genius and spiritual insight were evident in a work, rather than by more pedestrian criteria such as materials, brushwork, and whether a painting matched up well with other works from the same time period. A sort of romantic aura enveloped Rembrandt scholarship, and in this hazy atmosphere his oeuvre expanded to somewhere between 600 and 800 works that most people believed were autograph. Overindulgence is often followed by a hangover. In Rembrandt scholarship the headache set in around the time of the artist’s 300th birthday in 1966. At that time three huge exhibitions of Rembrandt’s work were mounted, and when the paintings were brought together it became evident that they were quite inconsistent in style, and that a great many of them must be by someone other than Rembrandt. A Dutch scholar who had worked with Bredius as a young man, Horst Gerson, was asked to issue commentaries for a revised edition of the older scholar’s catalogue and questioned about half the paintings it contained. Shortly afterwards, a team of five or six Dutch scholars banded together to create The Rembrandt Research Project and to issue a “definitive” catalogue of his oeuvre. For the first time, these scholars systematically obtained high-quality photographs and compiled accurate technical data on Rembrandt’s work, examining signatures, utilizing x-rays and radiographs, and even counting the threads on canvases. Museums and private collectors dreaded their visits, since they tended to demote works that had been accepted as authentic for decades. The Rembrandt Research Project, which is still not quite complete, has now been going on for 40 years (most of its founding members are now dead) and has revolutionized our understanding of Rembrandt’s work. But large areas of disagreement still remain. When they started the project, the Rembrandt Research team clearly believe that close technical examination would resolve nearly all questions about what Rembrandt did and did not paint, but before long they began to disagree with each other, and consensus became impossible. Generally speaking, most scholars agree that Rembrandt’s oeuvre is at most half the size it was considered to be in the 1930s—somewhere between 200 and 300 paintings. But precisely which paintings belong to this canon and which do not remains a matter of dispute. And thus, at this point we seem to be entering a third phase of Rembrandt scholarship, when modern science and 19th-century romantic ideas can interact with each other in new ways. The present exhibition picks up more or less where the Rembrandt team left off and contains a good many paintings that present questions of one sort of another. One of the major contributions of the show is to demonstrate that Rembrandt clearly interacted with other painters in his studio. He sometimes touched up their work so that he could sign and sell it as his own—a standard 17th-century practice—and they in turn sometimes revised paintings that he had executed and that for one reason or another didn’t sell. In one instance a “self-portrait,” executed either by Rembrandt or by one of his pupils, was revamped into a laughably absurd painting of a man with shaggy hair and a large hat. In another, a large Descent from the Cross (in the National Gallery in Washington, D.C.) was completely reworked and redesigned. X-rays reveal that it was originally painted around the mid 1630s, at which time it closely resembled a painting in the Hermitage. Around 1650, or shortly thereafter, it was severely cropped at the left and bottom, and virtually the entire composition was reconfigured. 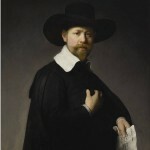 As has been nicely explained by Arthur Wheelock, curator of Northern Baroque paintings at the National Gallery, in a 1995 catalogue of the Dutch paintings in the National Gallery, close study of the brushwork suggests that these changes weren’t executed by Rembrandt but by a pupil, possibly van Renesse. It’s not clear what role, if any, Rembrandt had in this process, but the final result is far more memorable and poignant than the original design. Scholars seem to be more in agreement when dealing with Rembrandt’s early paintings than with the later ones. Perhaps that is because at this stage Rembrandt’s work was still not fully “Rembrandtesque,” and as a result we can look at the paintings on their own terms, with fewer preconceptions about artistic genius and what it means to peer into the depths of the human soul. This is also the phase of Rembrandt’s work in which there have been some of the most dramatic new discoveries. One of the highlights of “Rembrandt in America” is a pair of newly discovered paintings, symbolically representing the sense of touch, that were made before Rembrandt had reached the age of 20, and are possibly the earliest works by him we know. Not exactly beautiful—one of them portrays a painful operation—they bring out the iconoclastic side of Rembrandt’s talent, the pleasure he took in shocking the viewer into paying attention. 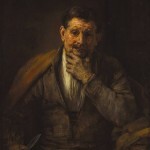 A beautiful painting that this show convincingly restores to Rembrandt’s oeuvre is the Portrait of an Old Man of 1632 in the Fogg Art Museum at Harvard, which has long been assigned to Jan Lievens or to an unknown follower of Rembrandt. To my eye it’s not only by Rembrandt but one of his finest works from this early period. On the other hand, the Bust of a Young Man with a Gold Chain, owned by the Cleveland Museum of Art, seems singularly dull and lackluster when placed beside autograph works by Rembrandt, and it’s hard to believe that it’s actually from his hand. Once we get into the 1650s, there seems to be more confusion as to who did what. Curiously, one of the best paintings in the exhibition, Rembrandt’s portrait of Titus, The Artist’s Son, from the Baltimore Museum of Art, has sometimes been questioned. It epitomizes the quality that distinguishes Rembrandt’s work from that of his students—a greater willingness to take risks or to reach out to capture evanescent impressions. Here it is evident in the highly peculiar way that Titus grasps his chin with his hand, a gesture that feels almost as if it were captured in motion. On the other hand, I’m not at all convinced by the Portrait of a Man Reading, from the Clark Art Institute in Williamstown, Mass., which seems more solid and less mysterious than Rembrandt’s autograph works, in a fashion more reminiscent of a hard-nosed 19th-century realist such as Courbet (though it is undoubtedly a 17th-century painting). A wonderful painting—but to my eye not by Rembrandt. The painting has often been linked to Carel Fabritius, and while this attribution may or may not be right, it seems closer in spirit to his work than to that of Rembrandt. With regard to the paintings not by Rembrandt, some of them have striking affinities with each other. For example, in the 1650s a close follower of Rembrandt made the very beautiful painting of a Portrait of an Old Man in a Cape in the Fogg, which has the solemnity of a Rembrandt but is just a bit more sentimental, with lighting just a bit less natural and less fluctuating. Could this be the same artist who created the Old Man Praying in the Cleveland Museum of Art, and perhaps even the so-called Portrait of Titus in the Wadsworth Atheneum? All three paintings are clearly modeled on Rembrandt’s style of the 1650s; all three have a similar slightly sentimental feeling, and all three handle form and light in a similar fashion, showing a single carefully posed figure, lit almost too artistically, as if by carefully directed theatre or photographer’s lights. Whether or not they are all by the same hand, they seem to exhibit stylistically similar features and to show close knowledge of Rembrandt’s work of the 1650s, and for this reason it seems useful to group them together. Needless to say, the exceptional level of confusion about what Rembrandt painted—and about the degree to which he touched up the work of his pupils, and created “half-Rembrandts,” or to which they made paintings of their own in his manner that are “not-Rembrandts”—makes writing about this artist a risky affair. Some of the most famous writings about him from the past, whether by Jakob Rosenberg or Eugène Fromentin, analyze paintings that we no longer consider to be by Rembrandt himself. Can we value their insights nonetheless, or should we view these authors as misguided sentimentalists? Can we avoid the same trap, or is our vision still clouded by a false view of who Rembrandt was and what he painted? In some ways this very state of ambiguity seems very well suited to the “virtual realities” of our postmodern age, in which we’ve become increasingly sensitive to the complexities and confusions of identity—and of assumed roles and identities. Indeed, it touches on some of the reasons why both Rembrandt’s art and persona seem alive to us today. Postmodern life and identity are multi-layered and complicated. Rembrandt’s art, and the shadow he cast on those around him, have a similarly confusing, hard-to-define aspect. Surely Rembrandt’s art—and the current show itself—poses questions about the shadowy qualities of truth and identity at many levels. What was Rembrandt’s identity, and can we recognize it? What was it about Rembrandt’s approach—as expressed not only in his own creations but in those of the pupils who fell under his influence—that seems to cut through surface appearances and penetrate to something deeper, that seems to probe into the essence of human nature?